A special display in the Foyer of the Woodward Medical Library at the University of BC features the collection of Ethel Johns’ Medals. 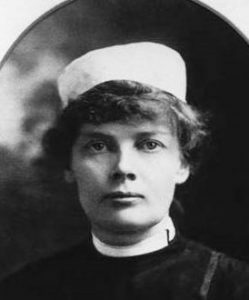 Johns, who was the first director of the UBC School of Nursing, gave her medals and awards to the Library late in her life. They include a King Edward Silver Jubilee Medal and a Mary Agnes Snively Medal (the latter from the Canadian Nurses Association). Ethel Johns has been honored by the Historic Sites and Monuments Board of Canada, Parks Canada, as a “Person of National Historic Significance” and the displays were set up because a plaque recognizing this honor is to be presented by the Canadian government to UBC this fall. The bronze plaque will be mounted in the patient park near the Koerner Acute Care Hospital Pavilion, which now houses the UBC School of Nursing.